I greatly appreciate smaller boxes for all the reasons stated above. Plus, I like to keep boxes I've opened. Smaller boxes = less space used in my closets. I'm liking the look of that! It still keeps all of the cool background art, so I'd be willing to have this change implemented throughout all boxes. Although I slightly agree with Apfly - the large boxes are more nicer to look at when sifting through my collection of boxen. Besides the fact this change is much better for the environment (a big issue for me), I think it will also help protect the set contents better. Right now, in their journey from factory to our homes, the Lego parts, figures and manuals constantly slide back and forth from one end of the box to the other, leading to scratches and dents on parts, folded sticker sheets and torn manuals. By keeping the pieces packed together tighter, the smaller boxes should reduce these issues. Good job Lego! Blacknight wrote: Besides the fact this change is much better for the environment (a big issue for me), I think it will also help protect the set contents better. Right now, in their journey from factory to our homes, the Lego parts, figures and manuals constantly slide back and forth from one end of the box to the other, leading to scratches and dents on parts, folded sticker sheets and torn manuals. By keeping the pieces packed together tighter, the smaller boxes should reduce these issues. Good job Lego! I can't say I've ever come across dents or scratches (maybe I've just been lucky), but if this helps with the manuals not being rolled up or bent at odd angles then I am for it even more than I was earlier. I noticed that this winter's sets have smaller boxes to begin with. Its strange they're re-packing the JSF in a smaller box... But look at the box for the V wing or Battle of Naboo, they're about the same size in length and width, but they're only about an inch thick, instead of the approx 2 inches of last years sets of the same "size" (droid bomber, hoth set with taun taun, etc). Good call Blacknight, that aspect didn't even occur to me but hallelujah for fewer ruined sticker sheets and mangled instructions, not to mention the occasional set that busts a bag wide open inside (especially those mesh bags). Nothing's more fun than opening a box and finding a lovely assortment of body parts, weapons, 1x1 studs, technic pieces and more floating around. It's about time you started this, Lego! I would buy the smaller one, as it is more efficient and easier to store. And will keep the DSS and instructions from being destroyed. Nearly every manual I get in large sets is mangled ! Anyone know what Walmart store this picture was taken? Tyrant wrote: I can't say I've ever come across dents or scratches (maybe I've just been lucky), but if this helps with the manuals not being rolled up or bent at odd angles then I am for it even more than I was earlier. If you hold clear parts (large windows etc.) or for example minifigure torsos under a desk lamp, you can often see the little scratches and marks by turning it at different angles under the light. On minifig torsos you can also get chips or rolled edges at the corners where the torso meets the legs. These marks may be small but they bug me quite a bit because I have very good short range vision (but bad long range vision). Fat Tony wrote: Anyone know what Walmart store this picture was taken? The store at 3661 Truxel Rd. in Sacramento, CA. Either I'm the only one that's noticed, or the difference is not as great as I think- the entire Pharaoh's Quest line have decidedly thinner boxes than other lines- I don't have a pictorial reference, but I did scale a 20 dollar PQ set with a 20 dollar set from an older line in the store- it's definitely thinner. To my knowledge, it's been like this since the line came out, so my guess is that it's something LEGO's started doing this year, which they've now started to spread through older sets as well. 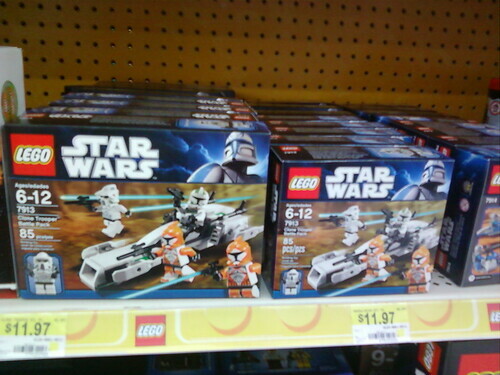 Just got home from the same WalMart and they were doing a massive store wide re-stock/re-organization so I checked out the lego section and there were A LOT more sets with smaller packaging, above are a couple examples of the new battle pack sizes, they are roughly 4.5 inches by 5 inches, they also had Pharoes Quest sets, Harry Potter sets, Toy Story (as shown), more Star Wars, Imperial V-wing in the same size box as the Starfighter, they had not only new Clone and Mando battle pack's but both the Hoth battle pack's were in smaller boxes. Even the Clone Turbo Tank box appeared to be smaller, still tall but not as long. I did not see any of the normal size boxes for the sets that had smaller boxes, I checked the clearance aisle but did not see any, not sure what happened to them, I doubt they sold them all in a few days, unless they did go on sale and I missed them. I think they look a lot better and make a lot more sense. Sorry I don't have exact dimensions but I imagine they will be rolling out all over pretty soon. I'm glad they've finally started to do this. Every time TLC had a survey, it's one of the things I'd tick or suggest if the option wasn't there! It's probably because gas prices are expected to skyrocket. That's great! I've been hoping they'd do that. So much less wasted material. TLG said they were going to smaller boxes in their 2010 annual report or progress report. (I can't remember which.) I think it is great. They're doing it for environmental and cost cutting reasons. I'm all for both of those. So I walk into my local target today and most every box was minisized. It was crazy, even the Kingdom Castle and the Airport were around 2/3 the size. Some were half size like the new star wars battle packs, the seaplane, police car. I took a bunch of pictures that I'll upload a little later. 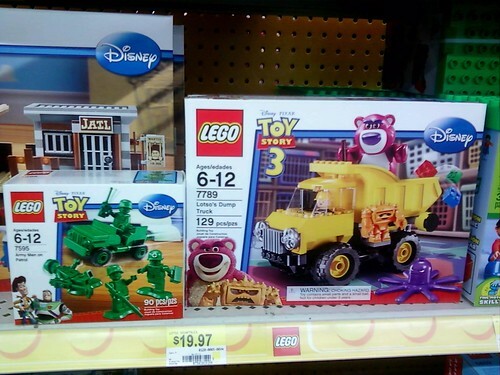 Toy Story got the treatment as well as some special edition sets like the new bank and cad bane's speeder. I agree with the smaller size of boxes for a few reasons. They can stock more on the shelf while taking less shelf space. This may even allow for a larger variety of sets at big box retailers that have done so much damage to TRU and other stand alone toy stores. They use less cardboard which is very green of them and always seemed a waste to me. Since the sets are moving around less you'll get fewer broken parts not that I've had a big issue with that. Anyways, good move Lego!